After going 10–0 to begin the season, the Patriots' first loss came against the Denver Broncos in overtime in Week 12. They would go on to lose four of their last six games, ultimately finishing the regular season with a 12–4 record for the fourth straight year. In Week 14, the Patriots clinched their seventh straight AFC East division title. By this, the Patriots tied the 1979 Los Angeles Rams for most consecutive division titles. As the second seeded team in the AFC, they secured a first-round bye for the playoffs and home-field advantage for their first playoff game. In the divisional round of the playoffs, the Patriots defeated the Kansas City Chiefs 27–20 to advance to the AFC Championship for the fifth straight year, where they fell on the road to the eventual Super Bowl 50 champion Denver Broncos 20–18. The Patriots were also close to rematching the Carolina Panthers in the Super Bowl for the first time since 2004. The Patriots played the Steelers on opening night, celebrating their Super Bowl victory from the season before. On the opening possession of the game, the Steelers drove all the way to the Patriots 26, but Josh Scobee missed a 44-yard field goal attempt. After the next two drives ended in punts, the Patriots engineered a 13 play, 90-yard marathon, lasting over seven minutes with Tom Brady hitting his go-to target Rob Gronkowski for a 16-yard touchdown and the early 7-0 lead. The Steelers once again drove deep into Patriots territory, but Scobee missed a 46-yard field goal wide right. The Patriots made the Steelers pay, driving 64 yards in 9 plays, scoring on Brady's 6-yard touchdown pass to Gronkowski, increasing the lead to 14-0. The Steelers finally responded driving back to the 26, but this time Scobee was good from 44-yards away and the Patriots led 14-3 at halftime. The Patriots offense continued with their first half pace, producing a second half opening drive of nine plays, 80-yards, finishing with Brady throwing a 1-yard touchdown pass to new acquisition, tight end Scott Chandler, widening the Patriots lead to 21-3. The Steelers countered with an 80-yard, 7 play drive, with Will Johnson scoring on a 1-yard touchdown run, and Ben Roethlisberger converting the two-point conversion on a pass to Markus Wheaton, trimming the deficit to 21-11. After a Patriots three-and-out, the Steelers marched 67 yards to the Patriots 1-yard line, but a penalty pushed them back to the 5 and DeAngelo Williams was stuffed for a loss bringing up 4th-down and Scobee converted the 24-yard field goal to make the score 21-14. The Patriots countered, aided by a 52-yard catch by Gronkowski, marching 79 yards in 7 plays, scoring on a 1-yard touchdown catch by Gronkowski, extending the lead the 28-14. Three possessions later, Roethlisberger was intercepted at the Patriots 7. After a Patriots punt, the Steelers raced 70 yards in 12 plays, scoring on an 11-yard touchdown pass to Antonio Brown with just :02 seconds left, trimming the deficit to 28-21. Gronkowski ended his superb night by falling on the subsequent Steelers onside kick attempt, ending the game. The match-up between the Bills and Patriots was highly anticipated in the week before the meeting. Both teams had won their first games of the new season and high expectations for the season ahead were falling on both teams, including the host team, who were led by new head coach and old Patriots' foe Rex Ryan (formerly of the New York Jets). The Guinness Book of World Records was invited to Ralph Wilson Stadium to see if the Bills' fans could break the decibel record for crowd noise that was set at Arrowhead Stadium by Kansas City Chiefs' fans in the season prior (coincidentally in a game that the Patriots also featured in as the away team). In a heated game-day atmosphere, the Bills took the opening kickoff and drove the ball 80-yards in ten plays, with rookie running back Karlos Williams scoring on a 2-yard run. Two possessions later, the Patriots, aided by completions of 16 and 36 yards to Aaron Dobson and Gronkowski respectively, raced 62 yards in only 5 plays, with Julian Edelman catching an 8-yard touchdown pass from Brady. After another Bills three-and-out, aided by a 28-yard punt return to the Bills 27 by Danny Amendola coupled with an unnecessary roughness penalty on the Bills, the Patriots need just two plays to go 13 yards and score on a 6-yard touchdown run by Dion Lewis, taking a 14-7 lead. On the ensuing Bills' drive, Tyrod Taylor was intercepted by Super Bowl hero Malcolm Butler, who returned it 9 yards to the Bills 30. The Patriots then marched 30 yards in just 5 plays, scoring on Brady's 6-yard touchdown pass to Gronkowski, extending the lead to 21-7. After a Bills punt, from the Bills 48, Lewis caught a 6-yard pass, but was stripped by Paul Brown with Corey Graham returning it 29 yards to the Patriots 33, but an unnecessary roughness penalty moved them back to the 48. After being forced to punt, the Patriots drove to the Bills 48, but on 4th-and-1 Brady fired an incomplete pass. The Bills finally scored again, racing 48 yards in four penalty marred plays, scoring on a 9-yard touchdown pass to Charles Clay, trimming the deficit to 21-13, after a missed PAT. The Patriots drove to the Bills 28 on their next drive and Stephen Gostkowski converted a 46-yard field goal, increasing the lead to 24-13. The Bills advanced the ball to the 50-yard line on the next drive, but Taylor was intercepted by Harmon a deep pass intended for wide receiver Sammy Watkins with 16 seconds remaining in the half. Brady took a knee on the ensuing drive, with the Patriots going into the half leading 24-13. The Patriots drove 77 yards on the opening drive, all the way to the Bills 3-yard line, but were forced to settle for a 21-yard field goal by Gostkowski, making the score 27-13. After a Bills punt, the Patriots raced 83 yards in 9 plays, with Brady capping off the drive with a 22-yard touchdown pass to a diving Edelman, growing the lead to 34-13. After a Bills three-and-out, the Patriots drove to the Bills 32 and Gostkowski upping the lead to 37-13 on a 50-yard field goal. As the game entered the fourth quarter and with many Bills fans already heading for the exits, the Bills were finally able to establish rhythm with their offense, as Taylor led Buffalo on a 10-play, 80-yard drive, bombing a 32-yard touchdown pass to wide receiver Robert Woods, with a failed two-point conversion, making the score 37-19. The Patriots drove to the Bills 41 on their next drive, but failed to convert. The Bills quickly capitalized, racing 59 yards in only 7 plays, with Taylor running in a 7-yard touchdown, with a missed two-point conversion, trimming the deficit to just 37-25. On the second play of the ensuing Patriots drive, Brady was strip-sacked by Jerry Hughes , with Preston Brown recovering for the Bills at midfield. It only took two plays to cover 50 yards, with Taylor finding Watkins for a 24-yard touchdown, making the score just 37-32 after being down 37-13. As had been the theme throughout the day, the Bills' defense was unable to keep Brady and the Patriots' offense from marching up-and-down the field, and on their final drive, New England drove to the Bills 8 and Gostkowski upped the lead to 40-32 on his 26-yard field goal. On the Bills' first play of the Bills next drive, Taylor was intercepted for the third time of the day, this time by cornerback Logan Ryan at the 50-yard line on a long pass intended for Watkins. Brady kneeled on the ensuing drive, securing the 40-32 win. The Bills' fans failed to set the Guinness World Record for loudest crowd noise. After forcing the Jaguars to punt, the Patriots 64 yards in just 5 plays, taking less than two minutes, to score on an 8-yard touchdown run by Lewis. The Jaguars moved the ball well on their next drive, reaching the Patriots 46, but on 3rd-and-12, Jabaal Sheard sacked Blake Bortles for a 6-yard loss, forcing Jacksonville to punt. The Patriots drove to the Jaguars 32 on their next drive, but a pass interference penalty moved the Patriots back to the 42, ultimately settling for a 45-yard field goal. The Jaguars then began a marathon 17 play, 58-yard drive, taking 8:24 off the clock, and converting four third-and-longs, but could only settle for a 40-yard field goal by Jason Myers. The Patriots countered, marching 78 yards in 14 plays to the Jacksonville 2-yard line, but the Jags defense held and the Patriots settled for a 20-yard field goal, increasing their lead to 13-3. The Jaguars drove to the Patriots 45 on their next drive, but McCourty intercepted the pass at the Patriots 16 and returned it 27 yards to the Patriots 43. The Patriots raced 57 yards in just 8 plays and 1:29, scoring on 1-yard touchdown pass to Danny Amendola, increasing the lead to 20-3. Bortles took a knee and the game went to halftime with the Patriots up 20-3. The Patriots drove to the Jaguars 21 on the opening drive of the second half, but on 3rd-and-13, Brady was sacked for a 7-yard loss by Ryan Davis and Gostkowski kicked a 45-yard field goal, increasing the lead to 23-3. After a Jacksonville three-and-out, the Patriots had one of the strangest scoring "drives" in NFL history. Gronkowski was flagged for offensive pass interference pushing the ball five yards back to the Patriots 33. On the very next play, Brady attempted a deep pass to Aaron Dobson that fell incomplete, but Jacksonville was flagged for pass interference moving the ball to the Jaguars 25. Again, on the very next play, Brady was intercepted by Davon House who returned the ball 82 yards to the Patriots 26, however, the Jags were called for pass interference again, moving the ball to the 1-yard line. On the very next play, LeGarrette Blount ran it in for a touchdown and a 30-3 Patriots lead. The Jaguars finally struck for a touchdown on their next drive as Blake Bortles hit Allen Hurns for a 59-yard touchdown pass to end the 80-yard drive. The Patriots were relentless, though. Following Jacksonville's touchdown, the Patriots matched with one of their own. Midway through the 7 play, 80-yard drive, a horse-collar tackle at the end of a 17-yard Blount run moved the ball to the Jaguars 15. Two plays later Brady hit rookie receiver Keshawn Martin on a 13-yard touchdown pass, increasing the lead to 37-10. After forcing the Jaguars into a turnover on downs, the Patriots didn't skip a beat marching 24 yards, needing only 5 plays, with Blount rushing for a 1-yard touchdown on the first play of the fourth quarter making the score an embarrassing 44-10. Following a Jaguars three-and-out, the Patriots took a page from the Jaguars playbook slowly moving 58 yards in 17 plays, taking 9:47 off the clock, scoring on another 1-yard touchdown run by Blount, blowing the lid off with a 51-10 score. Bortles commanded an 80-yard drive, hitting tight end Clay Harbor for a 6-yard touchdown. Jimmy Garoppolo took two knees and the game was over. Instead of the Tony Romo vs Tom Brady match-up, Brandon Weeden started due to Romo's broken collarbone he suffered in Week 2. 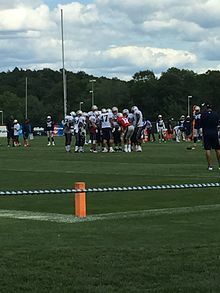 After the first three possessions of the game ended in punts, Amendola set the Patriots up with good field position with a 25-yard punt return to the Cowboys 45. After a 14-yard screen pass to Lewis to the 31, a 7-yard sack by Greg Hardy pushed the Patriots back to the 38, and they ultimately settled for a 49-yard field goal by Gostkowski. The Cowboys replied, driving to the Patriots 33 and Dan Bailey tied the game with a 51-yard field goal. Midway through the second quarter, the Patriots raced 55 yards in just over two minutes, scoring the first touchdown of the game on a 1-yard touchdown run by Brady, taking a 10-3 lead. The next three possessions of the game ended in punts, but with 0:53 seconds left in the half, the Patriots reached the Cowboys 39, and Gostkowski made the longest field-goal of his career, a 57-yarder, upping the lead to 13-3 at halftime. Brady was sacked five times in the first half. The Patriots increased their lead, stringing together a 9 play, 80-yard drive, scoring on a 10-yard touchdown pass from Brady to Lewis, increasing the lead to 20-3. The Cowboys countered, marching 75-yards in 15 plays to the Patriots 7, and trimmed the deficit to 20-6 on a 23-yard field goal. The Patriots struck again on their next drive, driving 80 yards in just 5 plays, scoring on a 59-yard touchdown pass from Brady to Edelman, widening the lead to 27-6. On the Cowboys next drive, after a 6-yard gain by Jason Witten to the Cowboys 43, he was stripped by Collins with Jonathan Freeny returning it to the Patriots 36. The Patriots turned the ball over on downs when Blount was tackled for no gain on 4th-and-1. The Cowboys drove to the Patriots 46 and Ryan intercepted Weeden at the Patriots 22, returning it 25 yards to the Patriots 47. The Patriots reached the Cowboys 16 and Gostkowski increased the lead to 30-6 on a 34-yard field goal. The Cowboys drove all the way to the Patriots 6, but turned the ball over on downs again. Once again Garoppolo took two knees and the game was over. For the third consecutive season the Patriots faced Andrew Luck and the Colts, with Luck looking to beat the Patriots for the first time in his career. The Colts overcame their inability to finish off drives like in years past, marching on a 13-play, 89-yard drive, draining 7:44 off the clock and scoring a 5-yard touchdown pass from Luck to Donte Moncrief for an early 7-0 lead. The Patriots answered, going 80 yards in 10 plays, with Brady finding Edelman for a 12-yard touchdown pass, tying the game 7-7. Afte a Colts three-and-out, the Patriots drove to Colts 22 and Gostkowski made a 39-yard field goal. After another Colts punt, Mike Adams intercepted Brady and returned it 14 yards for a touchdown. The Colts bizarrely tried an onside kick, but the Patriots recovered at their own 35. It took just four plays to score, with Blount busting off a 38-yard touchdown run, giving the Patriots a 17-14 lead early in the second quarter. The Colts countered yet again, though. Stringing together a 10 play, 80-yard drive, scoring on 3-yard touchdown pass from Luck to T. Y. Hilton, giving the Colts the lead again 21-17. The Patriots drove to the Colts 7 and Brady hit Chandler for a 7-yard touchdown, but the play was nullified on a pass interference call on Chandler. Gostkowski kicked a 35-yard field goal on the next play, giving the Colts a 21-20 lead at halftime. The Patriots took the first drive of the second half, driving 80 yards in 7 plays, scoring on Brady's 25-yard touchdown pass to Gronkowski, giving the Patriots the lead again 27-21. Four possessions later, the Colts reached the Patriots 37 and attempted a trick play on fourth down where nine players lined up wide right, while Griff Whalen lined up at center and Colt Anderson lined up as a quarterback, hoping to catch the Patriots offsides; the play failed and Anderson was sacked for a one-yard loss, leading a befuddled Al Michaels in the NBC Sports booth to mutter, "What in the world?" The Patriots declined an illegal formation penalty on the play. Taking over at the Colts 35, the Patriots needed just 6 plays, scoring on an 11-yard screen pass from Brady to Blount, increasing their lead to 34-21 a few plays into the fourth quarter. Several possessions later, the Colts drove to the Patriots 38, but turned the ball over on downs again. However, the Colts forced a quick three-and-out, and raced 85 yard in 8 plays, scoring on Luck's 18-yard touchdown pass to Whalen, with a missed extra point from Adam Vinatieri, keeping the score 34-27 with just 1:19 left. Gronkowski recovered the Colts onside kick attempt and Brady took two knees to end the game. This was the Patriots sixth straight win in the series. The game lead tied or changed five times by halfway through the third quarter. On the Jets' second play of the game, Ryan Fitzpatrick was strip-sacked by Jones with Hightower recovering at the Jets 19. The Patriots didn't gain a single yard, but Gostkowski gave the Patriots the lead on a 38-yard field goal. The Jets countered with a 15 play drive all the way to the Patriots 2-yard line, but were forced to settle for a 20-yard field goal by Nick Folk. After a Patriots punt, the Jets strung together a 14 play, 83-yard drive scoring on a 5-yard touchdown pass from Jeremy Kerley, giving the Jets a 10-3 lead in the second quarter. A few possessions later, the Patriots marched 47 yards, scoring on a 1-yard touchdown run by Brady on 4th-and-Goal, tying the game. After a Jets punt, Edelman gave the Patriots a good start with a 17-yard return to the Patriots 41. The Patriots drove to the Jets 20, but an 8-yard sack by Calvin Pace forced the Patriots to settle for a 47-yard field goal, giving the Patriots a 13-10 lead at halftime. After Amendola returned the opening kickoff 28 yards to the Jets 29, the Patriots drove all the way to the Jets 6, but were forced to settle for another field goal, increasing the lead to 16-10. The Jets countered with a 13 play, 80-yard drive, taking seven minutes off the clock, scoring on a 9-yard pass to Chris Ivory, giving the Jets a 17-16 lead. After a Patriots punt, the Jets drove all the way to the Jets 12, but settled for a 30-yard field goal by Folk, increasing their lead to 20-16 a few minutes into the fourth quarter. The Patriots countered with a 10 play, 80-yard march, scoring on an 8-yard touchdown pass to Amendola, retaking the lead 23-20. After the Jets punted, the Patriots scored again, with Brady's 15-yard touchdown pass to Gronkowski widening their lead to 30-20 with just 1:13 remaining. The Jets drove to the Patriots 37 and Folk trimmed the deficit to 30-23 with a 55-yard field goal with just 0:18 seconds left. Brandon Marshall recovered the onside kick at the Patriots 49 with 14 seconds left, giving the Jets a chance to tie game. After a 12-yard catch by Eric Decker, Marshall was flagged for a false start, allowing the clock to run out and end the game. The Patriots took the opening kickoff and after mostly short completions and Blount runs, Brady hit Gronkowski for a 47-yard touchdown pass for an early 7-0 lead. Ryan Allen's 35-yard punt stuck the Dolphins at their own -1. On third-and-10, Ryan Tannehill was sacked by for a safety and a 9-0 Patriots lead. The Patriots opened the game with a 14 play, 80-yard drive, converting three third-downs and taking eight-and-a-half minutes off the clock, scoring on a one-yard touchdown pass to Chandler. The Giants needed just 51 seconds to score. After a 4-yard run by Rashad Jennings, Eli Manning hit Odell Beckham Jr. on 87-yard catch-and-run for a touchdown. After both teams went three-and-out, the Patriots drove all the way to the Giants 8, but on 3rd-and-4 Brady was sacked by Craig Dahl for a 5-yard loss and Gostkowski gave the Patriots the lead with a 31-yard field goal. On the ensuing drive, the Giants drove all the way to the Patriots 16, but Manning was strip-sacked by Chandler Jones with Justin Coleman recovering at the Patriots 16. After a Patriots three-and-out, the Giants drove all the way to the Patriots 11, but settled for a 29-yard field goal by Josh Brown, tying the game 10-10. After a Patriots punt, the Giants engineered a 7 play, 74-yard drive, scoring on a 1-yard touchdown pass to Dwayne Harris, giving the Giants a 17-10 lead with 13 seconds left in the half. Brady took a knee and the game went to halftime. The Giants took the opening kick of the second half and marched 60 yards to the Patriots 20 and Brown extended the Giants lead to 20-10 on a 38-yard field goal. Later, after forcing the Giant to a three-and-out, Amendola returned the punt 82 yards to the Giants 7. Three plays later, scoring on a 1-yard touchdown run by Blount, trimming the deficit to 20-17. The Giants countered, driving all the way to the Patriots 35 with Brown draining a 53-yard field goal increasing the lead to 23-17. On the first play of the fourth quarter, Brady was strip-sacked by Jasper Brinkley with Markus Kuhn returning it 8 yards to the Patriots 31. Ninkovich sacked Manning for a 13-yard loss on the first play and the Patriots forced the Giants to a three-and-out. Starting at their own 14, two completions moved the Patriots to the 24. On the next play, Brady hit Gronk on a 76-yard catch-and-run for a touchdown, giving the Patriots a 24-23 lead. After a Giants three-and-out, facing a 3rd-and-4, Brady hit LaFell on a 54-yard bomb to the Giants 15. Four plays later, Blount scored on a 1-yard touchdown run, but the play was nullified by a holding penalty on David Andrews. Three plays later, Brady was intercepted at the Giants 1 by Trumaine McBride who returned it 2 yards to the 3. The Giants drove to the Patriots 5 and Manning hit Beckham for the go-ahead touchdown, but after official review, it was ruled that he stepped out of bounds before becoming a runner, and it was ruled an incomplete pass. After an incomplete pass, Manning was sacked for a 6-yard loss. Brown kicked a 29-yard field goal, giving the Giants a 26-24 lead with 1:47 remaining in the game. On the very first play, Brady was seemingly intercepted by Landon Collins on a deep pass attempt for Aaron Dobson, but Collins didn't maintain control and it was ruled an incomplete pass. After two straight incomplete passes, Brady hit Amendola for a 12-yard gain on 4th-and-10. The Patriots drove to the Giants 36, and Gostkowski made the 54-yard field goal after the kick seemed to be sailing right, giving the Patriots a 27-26 lead with 1 second left. The Giants tried a lateral on the ensuing kick, but Beckham was knocked out of bounds at the Giants 11 and the Patriots escaped, keeping their undefeated season alive. With the win, the Patriots improved to 9-0 for the first time since their undefeated regular season of 2007, and snapped their three-game losing streak against the Giants dating back to Super Bowl XLII. With a Bengals loss to the Texans the same week, the Patriots remained the only undefeated team in the AFC. In a game that the Patriots were expected to dominate, the Eagles pulled a massive upset. Tom Brady would throw 2 costly interceptions in this game, one of them a pick 6 returned 100 yards by Malcolm Jenkins. The Pats would trail as big as 35-14 over 80% of the way through the game, and Brady tried to lead them back, but he couldn't, as Philadelphia's defense forced a turnover on downs to end the game. With the loss, New England fell to 10-2. This would be the Patriots' first loss to the Eagles (preseason notwithstanding) since Tom Brady took over as the starting quarterback in 2001. After the first three possessions of the game ended in punts, the Patriots struck first. Midway through the first quarter, Brady hit Gronk for a 45-yard catch-and-run to the Patriots 7. Two plays later, Brady threw a 6-yard touchdown pass to LaFell, but the play was nullified by an illegal formation penalty, pushing the ball back to the 11. Two plays later Brady threw a two-yard touchdown pass to Keyshawn Martin, which counted, and the Patriots led 7-0. The Texans reached the Patriots 20 on their ensuing drive, but were forced to settle for a 38-yard field goal by Nick Novak. The Patriots answered by reaching the Texans 25, but their stiff defense forced the Patriots to settle for a 43-yard field goal by Gostkowski. The Texans responded with a second straight field goal, this one a 45-yarder. After both teams traded punts, the Patriots took advantage of great field position (the Texans 41) and increased their lead to 17-6 with Brady's 1-yard touchdown pass to Gronkowski with just 0:14 seconds left in the half. The Patriots took the opening kickoff of the second half, and, despite only reaching the Texans 31, Gostkowski was good from 49 yards away, and the Patriots led 20-6. The Patriots forced another punt, but Martin muffed it with recovering at the Patriots 21. However, the Patriots stout defense only allowed 6 yards and the Texans turned the ball over on downs. Early in the fourth quarter, Sheard stripped Brian Hoyer with Malcolm Brown recovering at the Texans 7. Three plays later, James White scored on a two-yard touchdown run, putting the game out of reach. The Texans did nothing on their final two drives and the Patriots won the game. With the win, the Patriots improved to 11-2, and they clinched the AFC East title for a seventh straight season after the Giants defeated the Dolphins the following Monday night. Their seventh straight division title tied the Rams franchise for the most consecutive division titles won by one team in NFL history. After a Titans three-and-out, the Patriots put together an 11 play, 79-yard drive, with Brady hitting Gronkowski on a 5-yard touchdown pass. Three possessions later, Akiem Hicks returned a Marcus Mariota fumble 14 yards for a touchdown, increasing the Patriots lead to 14-0. After another Titans punt, Amendola fumbled with Cody Riggs recovering at the Patriots 26. The Titans could only reach the Patriots 21, but Ryan Succop got the Titans on the board with a 49-yard field goal. Keshawn Martin returned the ensuing kick 75 yards to the Titans 30. Two plays later, Brady hit White for a 30-yard touchdown, widening the lead to 21-3. Zach Mettenberger replaced Mariota on the next drive, and the Titans drove to the Patriots 38, but on 4th-and-1, Antonio Andrews stuffed for no gain. The Patriots drove to the Titans 25 and Gostkowski increased the lead to 24-3 on a 43-yard field goal. Amendola returned the ensuing punt 22 yards to the Patriots 45. The Patriots drove to the Titans 30, but Gostkowski missed the 48-yard field goal wide right, keeping the score 24-3 at halftime. After the Patriots punted, aid by an 18-yard punt return by Harry Douglas, the Titans drove 59 yards in 7 plays, with Mettenberger finding Delanie Walker for a 7-yard touchdown, trimming the deficit to 24-10. The Patriots responded by driving to the Titans 20, and Gostkowski was good from 38 yards away. Three possessions later, the Titans reached the Patriots 36, but Mettenberger was intercepted by Butler at the 2. After a Patriots three-and-out, Mettenberger hit Walker again for a 57-yard touchdown pass, with a missed extra point, making the score just 27-16. The Patriots drove to the Titans 23, and Gostkowski upped the score to 30-16 with his 41-yard field goal. The Titans drove to the Patriots 48, but Mettenberger was intercepted by Collins who returned it 51 yards to the Titans 16. Four plays later, Gostkowski hit a 32-yarder, making the score 33-16. The Titans ran out the rest of the clock to end the game. With the win, the Patriots improved to 12-2, and they clinched a first-round bye following the Broncos' loss to the Steelers later that night. This game is well known for the controversial coin toss to begin overtime. During the toss, New England would win the toss after choosing heads. However, they would choose to kick off to the Jets instead of receiving the ball. Captain Matthew Slater would shortly after get confused, and asked if the Patriots, because they won the toss, could also elect which way to kick. Clete Blakeman, the referee of the game, responded by saying that New England had elected to kick. The Jets would get the ball first, and the coin flip gaffe would bite the Patriots, as the Jets won after scoring first on their first possession. With the bitter loss, the Patriots fell to 12-3. MIA – Andrew Franks 38-yard field goal, 8:07. Dolphins 3–0. Drive: 10 plays, 54 yards, 3:43. NE – Stephen Gostkowski 34-yard field goal, 8:06. Tied 3–3. Drive: 11 plays, 48 yards, 6:01. MIA –DeVante Parker 15-yard pass from Ryan Tannehill (Andrew Franks kick), 0:36. Dolphins 10–3. Drive: 8 plays, 64 yards, 1:20. NE – Steven Jackson 2-yard run (Stephen Gostkowski kick), 12:32. Tied 10–10. Drive: 4 plays, 80 yards, 2:28. MIA – Jordan Cameron 2-yard pass from Ryan Tannehill (Andrew Franks kick), 6:58. Dolphins 17–10. Drive: 6 plays, 82 yards, 2:52. MIA – Andrew Franks 19-yard field goal, 1:56. Dolphins 20–10. Drive: 9 plays, 44 yards, 2:45. Just days before Week 17, the Patriots acquired running back Steven Jackson, who was known for his tenure with the St. Louis Rams. The acquisition of Jackson sought to help with the team's injury-laden running game. However, his New England debut was ruined as he rushed for 35 yards and the Patriots ended up losing 20-10. This would be the Patriots' last road loss until Week 14 of the 2017 season, also in Miami. The Patriots would upset the Chiefs, who came into this game having won 10 in a row to end the regular season, and a playoff game at Houston the previous week. The game was a shootout, as both quarterbacks played well. The Patriots would lead for most of the game. The Chiefs would try to come back later on to try to tie it, but the Patriots would win 27-20. With the win, New England advanced to its 6th straight AFC Championship game, and faced Denver for the second time in 3 seasons. DEN – Owen Daniels 21-yard pass from Peyton Manning, (Brandon McManus kick), 7:32. Broncos 7–0. Drive: 11 plays, 83 yards, 5:30. NE – Steven Jackson 1-yard run (extra-point failed, wide right), 1:49. Broncos 7–6. Drive: 2 plays, 22 yards, 0:34. NE – Stephen Gostkowski 46-yard field goal, 14:06. Broncos 14–9. Drive: 13 plays, 48 yards, 6:44. DEN – Brandon McManus 52-yard field goal, 0:33. Broncos 17–9. Drive: 6 plays, 23 yards, 1:13. NE – Stephen Gostkowski 38-yard field goal, 10:26. Broncos 17–12. Drive: 8 plays, 47 yards, 2:49. DEN – Brandon McManus 31-yard field goal, 10:02. Broncos 20–12. Drive: 10 plays, 48 yards, 4:58. NE – Rob Gronkowski 4-yard pass from Tom Brady (2-point conversion failed), 0:12. Broncos 20–18. Drive: 8 plays, 50 yards, 1:40. Denver would lead the entire game, as their number 1 ranked defense held Tom Brady and New England's number 1 ranked offense to only 18 points. In the closing minutes of the game, the Patriots would score with only 18 seconds left in regulation on a drive where Brady exclusively targeted Gronkowski; however, during the 2-point conversion, Brady attempted to hit Edelman over the middle while Gronkowski was open and his pass was intercepted. The Patriots would then attempt an onside kick, but were unsuccessful in their attempt and the Broncos won 20-18, advancing to Super Bowl 50. This would be the last encounter between Tom Brady and Peyton Manning as Manning would retire the following season. Manning ultimately ended his career with a 3-1 record against Brady in AFC Championship games. With the loss, the Patriots ended their season with an overall record of 13-5. ^ "Pats trade Logan Mankins to Bucs". ESPN. August 27, 2014. Retrieved August 27, 2014. ^ Patra, Kevin (October 22, 2014). "Titans trade linebacker Akeem Ayers to Patriots". NFL.com. Retrieved October 22, 2014. ^ Rosenthal, Gregg (September 1, 2012). "New England Patriots trade for Greg Salas from Rams". NFL.com. Retrieved September 1, 2012. ^ Goss, Nicholas (May 1, 2015). "2015 NFL Draft: Patriots Trade Third, Seventh-Round Picks to Browns". New England Sports Network. Retrieved May 2, 2012. ^ Young, Shalise Manza (May 2, 2015). "Patriots make trade with Packers, gain one more pick". The Boston Globe. Retrieved May 2, 2012. ^ "PATRIOTS 28, STEELERS 21: Gronk, Brady get season started off right". The Providence Journal. 2015-11-10. Retrieved 2015-10-03. ^ "It's official: Guinness World Records coming to Bills-Patriots game to measure crowd noise". Syracuse.com (The Post-Standard). 2015-09-17. Retrieved 2015-10-10. ^ "Patriots 40, Bills 32: Tom Brady gets last laugh once again". The Providence Journal. 2015-09-20. Retrieved 2015-10-10. ^ "Buffalo Bills' fans get loud, but not loud enough to set record". The Buffalo News. 2015-09-20. Retrieved 2015-10-10.